The trailer for Super Mario Crossover 3.0 is released on the 3 year anniversary of SMBC and Exploding Rabbit. 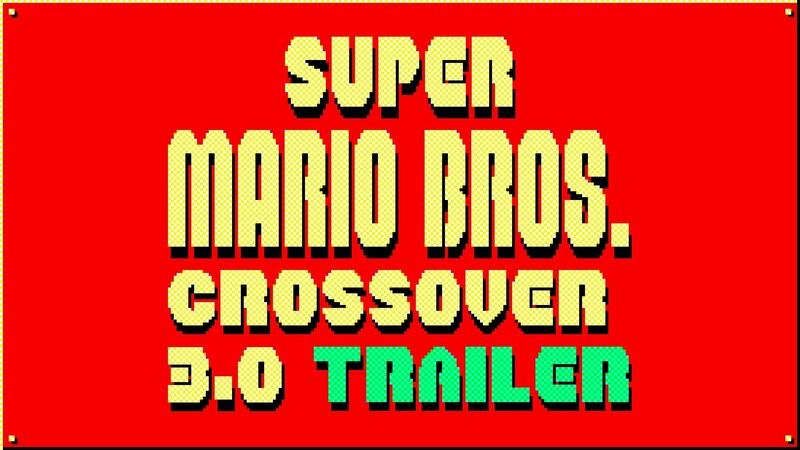 Today is the three year anniversary of Super Mario Bros. Crossover, so we figured it was a good day to release the trailer for version 3.0. Finally, we’re going to have more levels. We decided to take the levels from an obscure Mario game called Super Mario Bros. Special. It is a pretty weird game that even has some new items and enemies. Playing the game is an absolute nightmare because it’s on an old Japanese computer and it has many technical limitations. Now that it’s playable in SMBC, it can finally be enjoyed like other Mario games. Also, I know that people want The Lost Levels in the game, but we decided to do “Special” first since it’s something different. We’ll be working on The Lost Levels for a future update. The other big feature we’re adding is levels that change based on difficulty. This means if you play on easy mode, you’ll play an easier version of each level, and for hard mode, a harder version. I really enjoy the hard mode levels. Since I’ve played the game so many times, I’m used to playing through the levels pretty quickly, but on hard mode, I have to stop and think about what I’m doing. It’s really fun, and it plays with the player’s expectations. Easy mode is also fun. Instead of just making the levels easier, we added tons of coins. It makes you want to collect as many as you can so it changes the gameplay a bit. And of course, there are new skins. Many of the skins in the trailer were released in version 2.1, but I included them since many people may not be aware of them. The new map skins are Super Mario Bros. 2 (NES and SNES), Super Mario Bros. Special, Atari, and Castlevania. There are also some new character skins that were not shown in the trailer only because there is so much stuff in the game it’s difficult to show it all. As mentioned in the trailer, the new version will be released in May or June. In addition to the three year anniversary of SMBC, it is also the three year anniversary of Exploding Rabbit. It’s always fun to look back on the anniversary and see where I was last year. If you would have told me one year ago that I was going to raise $53,000 and move across the country to work with people I never met on a commercial game, I would have told you that you’re crazy… and I still think you’re crazy, but that’s what happened. We finally seem to be settled into the house and have most of our finances and lives in order, so we’re able to get a lot more work done now. I think you’ll notice that you’re going to see a lot more stuff from us now because of that. I’m also focusing a lot more on being more social and transparent online, so there shouldn’t be any long gaps of silence from us. I’m hoping to release videos pretty regularly now, and maybe, for once, I’ll be able to do it. And I’m sure you noticed, but we have an updated logo. It’s a bit more colorful and fun, and I think it fits the company well (although it almost seems too colorful for the current design of the site, but let’s just ignore that for now). Hmm… I seem to be writing a lot, and lots of text on one page scares me, so I’ll stop. Happy anniversary to everyone, and thanks for helping to make my life a crazy adventure. I will never gonna get tired playing this awesome game and I will also invite my friends to play. Keep up the good work. im sure other people has said this but has anyone thought about making a version of this on iOS or PSVita / PS4? this game on those systems would make sense being that people and the industry really likes retro and indie stuff right now. no, seriously. has anyone thought about putting Super Mario Crossover or Super Action Squad on anyone one of those platforms? A handheld or console version of this seems like it would make sense given how the industry loves retro and indie games right now. Plz Make SM64 crossover with all 64 charectecters from n64 and will we realy get tht hammer in smc? How hard is it too include sonic in 3.0 or 3.anything? All you gotta do is add a sonic skin for mario and fix the damn physics so sonic plays better, THAT’S IT. Where is my damn game? Dead line today should I remind you… If the game’s dealyed a second time I think you are taking too much your time. velho, agente ja ta em 27/07 CADE O JOGO ????????????? Put Sonic and Pikachu on the game!!!!!!!!!!!!!!!! I think you should use the 2D graphics from Link’s Awakening DX, because there are a lot of Mario enemies in that game…. One, Sonic will not be in Super Mario Bros. Crossover, regardless of how many pirated games on the NES or SNES he appeared on. Jay said it himself. Two, SMBC 3.0 will be coming out at the end of July. Stop complaining, you big babies. Three, Bass is in the game because the design Jay used was based off of Mega Man 9/10, which was made in the same style as NES games, and thus, by proxy, appeared on the NES. Five, if you’re complaining about some powerup not making it in, this is a REMAKE of the original Super Mario Bros., before those powerups existed. THUMBS UP IF MARIO 63 SHOULD HAVE A SEQUEL! ONE OF THE BEST UNOFFICIAL MARIO GAMES EVAH! come on guys where is this game? It’s now July, Where’s 3.0? can you give a health bar for Megaman?